The Munich Cardinal Reinhard Marx has put into perspective reports of alleged persistent criticism of Pope Francis . He could "not identify a weakness of authority" and also not recognise "that a group of curial officials in the back room plots the downfall of the Pope," said Marx at his traditional year-end meeting on Friday in the Munich Press Club. "The Pope is one who governs, that does not please everyone," added the Chairman of the German Bishops' Conference. In particular, "some of the very conservative circles" do not want to accept that. Marx said he did not want to deal in conspiracy theories, but one would have to ask the question of who has an interest in damaging the Pope. He was in favour of an open discussion, but "anonymous books do not help". He was also worried that the criticism of Francis was in part "very much geared to the reputation of the person". He has said to the Pope, "You know that 90 percent of the people of God are behind you." Francis gives him, Marx, the impression of a "free man who goes on his own path unerringly". About the Pope, "it's not just about style issues," the cardinal affirmed, "but also a new way of looking at things, without any theological break." Francis also, in the fifth year of his pontificate, in observed worldwide. People were interested in what he said, "even in subordinate clauses and small interviews." For him, Marx, it continues to be "a great pleasure to work for this pope". 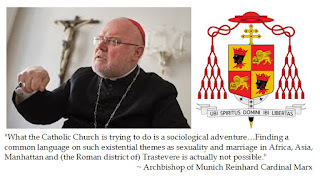 As a member of the nine-member Cardinals commission, the Munich archbishop is one of the closest co-workers of the church leader. " Simply untrue. For if it were true, Catholicism simply would not continue to exist.